Among Philadelphia playwrights, Emma Goidel is a rising rock star. 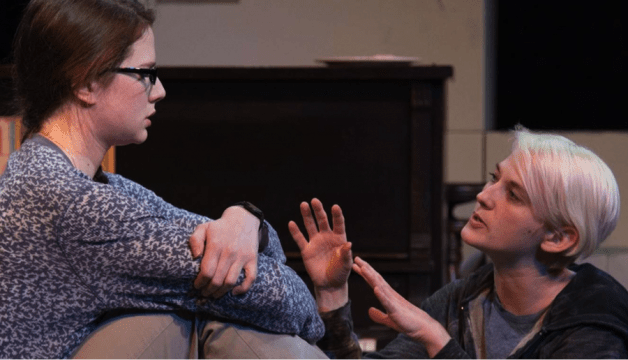 Two months ago, her play, A Knee That Can Bend, premiered by Orbiter 3 (she’s a co-founder), was rapturously reviewed by many critics, including Bryan Buttler at Ticket / Philadelphia Magazine. With Local Girls, premiering at Azuka, Goidel bids to become a rock star more literally. Knowing only the premise (high school students form a band, hoping it will help them escape a dreary future in suburban Atlanta), I wasn’t sure it was for me. I’m no fan of heavy metal — would there be a lot of music? Or would it feel like an after-school special? Worst case scenario — might it be something like (gulp) Glee? I’m happy to report it’s not like Glee. Music of various kinds plays a significant part, but Local Girls is definitely a play. Still, Goidel, obviously a gifted writer, makes something of the familiar story. She has a good sense of structure — also an ear for flavorful dialogue, though here, it sometimes sounds self-conscious, like she’s trying too hard to nail a sense of youth-speak. Similarly, a few of the actors — Tuomanen especially — over-work their quirky teenage personas. Szapiro, though, is terrific. The best moments in Local Girls are the simplest ones, especially the awkward conversations between Diskit and Francis, her dad (a charmingly natural Sam Henderson). So in the end, maybe Local Girls is a bit of an after-school special. But for the right audiences especially, it’s one worth seeing. Local Girls runs through March 13. For more information, visit the Azuka Theatre website.